Now, I’m not saying I’ve accidentally brainwashed myself but I definitely may have. All week at work I have spent my days creating Pinterest boards about Audrey Hepburn and 1950’s dresses (hard life, I know) but today I really wanted to wear a dress with a nipped in waist. 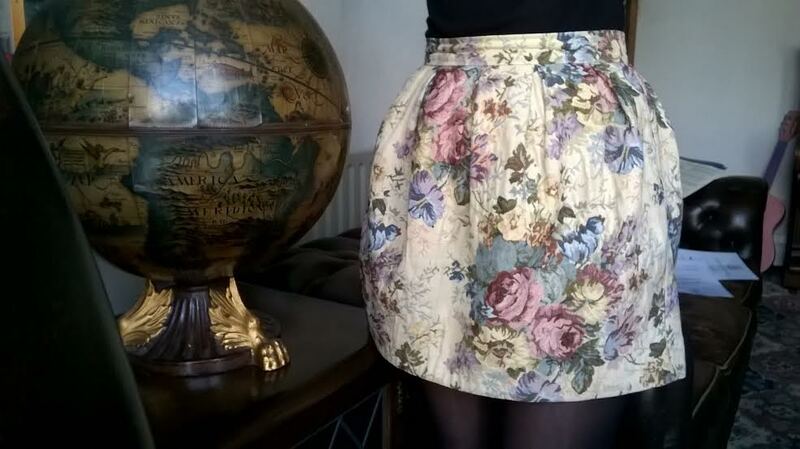 As I’ve just binned most of my day dresses, I had to compromise with this skirt. But it does have a nipped in waist, and is kinda poofy so I’m pretty happy. Apart from when I sit down and have to wrestle with it or risk flashing, it’s all fun in my office. In the title of this post I’ve called it the curtain skirt, because I don’t know what else to call it. It is a mini skirt, and it is fairly structured but that just doesn’t cover it. When I first unveiled it post-shopping trip, my dad likened it to being made out of a pair of old curtains because it’s woven and is (deliberately) faded in places. It also feels like a curtain, so don’t say I didn’t warn you. Going slightly off track, I did actually Google ‘curtain skirt’ before writing this and it turns out ‘curtain skirt’ is actually a piece of fabric you effectively wrap around a sink in the bathroom. If you came here to see me modelling bathroom accessories; sorry to disappoint you. 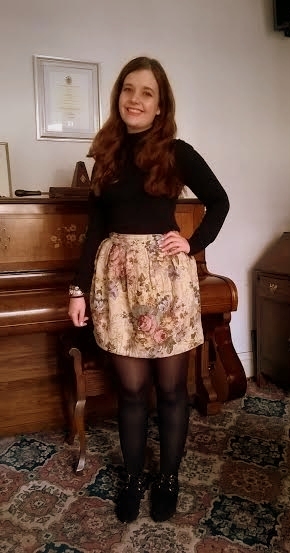 I teamed this skirt with black tights and a black polo neck jumper because it has been bloody cold today. Looking back though, Audrey could have influenced me there. If three hours on Pinterest teaches you anything, it’s that Audrey Hepburn was a fan of a black roll neck top. The shoes are my current go-to, for two reasons. They are awesome (you can read more about them here) and other than my trainers; they are the only flat shoes I own. I know some fashion bloggers try and convince us that trainers and tights are a thing, but they are not pulling the wool (or nylon) over my eyes with this one. Ideally I would have liked to wear a necklace with this top, just to brighten it up a bit, however I was running a bit late this morning. As unfashionable as it is to admit, when the choice between selecting jewellery and making lunch came; the food won outright. Although these aren’t the best photo of me ever, I am secretly congratulating myself on not having hagrid-esque hair as much as I feared, after going to be with it wet. The photos also mean I get to showcase the globe which has made a triumphant return from the loft. Previous Post What’s The Right Age, To Worry About Aging? Hello, I very much enjoyed going through your post; super cool, interesting (and stylish too!!) Love Andrey Hepburn, jel of your work week! Keep it up! Come check out my blog if you get the chance, I recently posted my favourite looks from Cannes film festival, would love to know what you think?